We are a unique entity in the industry, actively committed to offering an optimum quality range of 12 Micron Silver Laminated Paper Roll. Outfitted with a modern infrastructure, we are the most prominent manufacturer of a wide array of Metalized Films. 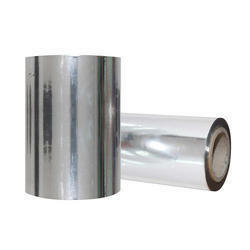 8 micron metallized silver BOPP film are used in packaging industry. We are passionately engaged in manufacturing an exclusive array of Metalized Polyester Film. Being one of the trusted firms in the industry, we are highly engaged in providing a unique range of Metallized Polyester Film.